Window awnings are external window coverings that have been around for hundreds of years. Window awnings date back to ancient Egypt, Syria and Rome, and were used most famously on the Colosseum. Awnings are attached to the outside wall of your house, providing a shield from the sun. They will keep your home cooler, reduce your air-conditioning bills, and help protect furnishings from sun damage. As well as being used over windows, these window coverings can be installed above doors, or used to shade decks or patios. Complete Blinds have an extensive range of different styles to choose from. If you already have awnings installed, we offer a recovering service. Save your money and have your existing frames recovered! Canopy awnings are a perfect choice for anyone wanting to add sophisticated and elegant awnings to their home or business. They come in a number of shapes & styles, and can be installed in walkways, windows, doors, etc. 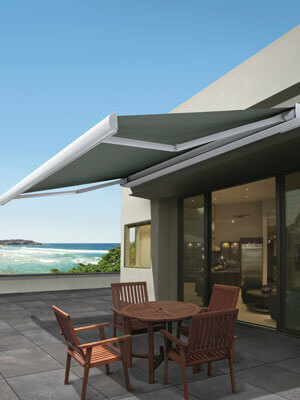 Use Clear PVC awnings to protect outdoor entertainment areas from the effects of wind and rain. These café-style awnings allow for customization depending on your needs. 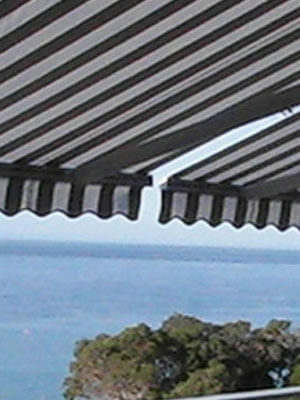 These awnings are raised and lowered using folding arms located at the outer edges. The benefit of folding arm awnings is that they do not have frames and posts, so you can move around freely under the awning. Also known as automatically retractable awnings, you can lower or raise Spring-loaded awnings by holding the rail of your window awning and adjusting it according to your needs. 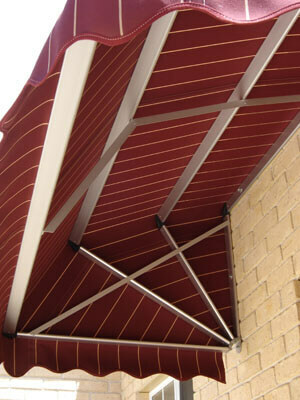 Straight drop awnings are very easy to operate. They are raised and lowered using a rope and pulley system found at the back of the awning, and are operated using a stainless cable-guide, crank control or channel-guide operation. System 2000 awnings are perfect for two-story and multi-story applications. The flexibility of these awnings allows for design consistency across all levels of a building. Are your existing awnings tired, worn or torn? 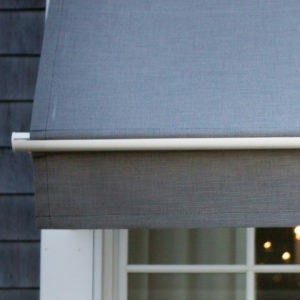 Rather than replacing your awnings, Complete Blinds can re-cover them with a modern and durable fabric! In most cases, we can re-cover your awnings onsite. Are Your Fabric Awnings Suffering Wear And Tear? A window awning is an exterior device that is typically made of metal or canvas that provides shade over windows, doors or patios. Awnings offer protection from the sun, rain, snow and other elements. 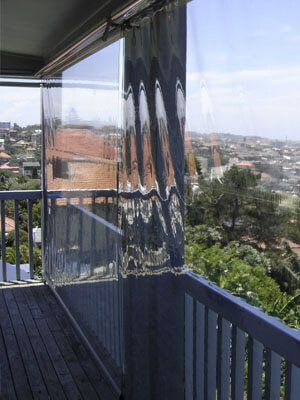 By minimising direct sunlight, they lower energy consumption by reducing the temperature inside the home. They can protect indoor furniture, carpets, flooring and wallpaper from fading. For businesses, awnings can be used as a marketing tool to create a corporate image, as well as to draw the attention of passers-by. They can also be a cost-effective way of advertising a brand or a product. 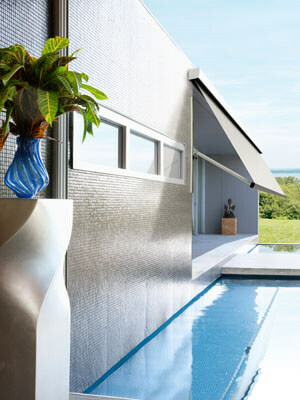 Awnings can provide privacy – both for exteriors and interiors. Aesthetically, they also add beauty to your home by enhancing the architecture. Awnings can serve as a finishing touch by giving an elegant and sophisticated look to any home or establishment. Awnings can provide UV protection. Nowadays, people are conscious of skin damage from the sun, and with awnings, this can be avoided. Awnings also aid in the expansion of space – so home or business owners can optimize outdoor areas. These are permanently attached to a building and cannot be raised or lowered. However, they offer a traditional style and are extremely durability. Retractable awnings are usually made from canvas or other durable fabrics. They are cantilevered structures that are entirely supported by the building and by a support frame, and can be easily adjusted to provide maximum shade when required. Mechanical awnings provide ease-of-operation and can be integrated into a Smart Home system or operated with a remote control. Many of our awnings can be motorised. Read more about Somfy motorisation technology. Why Choose Complete Blinds for Awnings? 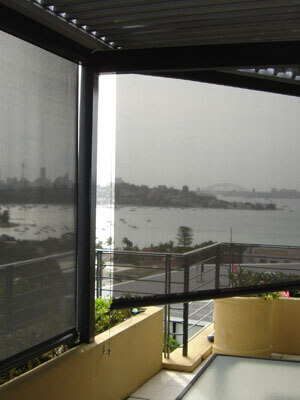 For many years, we have been one of the leading suppliers of blinds, awnings and shutters in Sydney. Due to the scope of our business, we are able to buy in large stocks and pass affordable prices onto our esteemed customers. Quality – We supply high-quality awnings, blinds and shutters, and we are proud of the products we offer. Our consistent goal is to enhance the livability of Sydney homes, and to offer window coverings that add value and aesthetic appeal to all homes and businesses. Service – Customer satisfaction is central to our business. We offer a personalized and thorough service, and always consider your budget and goals. Value – Our Company has long-term relationships with suppliers, and because of our maximum buying power, we pass savings onto our loyal customers. 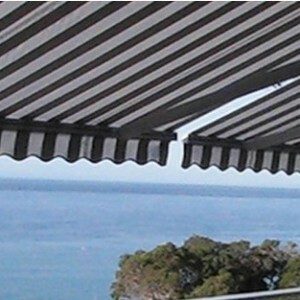 This way, you can enjoy the benefits of awnings without substantial cost. Complete Blinds offer great online deals. In fact, you need look no further! We have a great range of awnings, and we are confident that you will find a design that fits your home, and your budget. If you would like to speak with a consultant, or organise a quote, please call on 02 8824 7975 or contact us online. 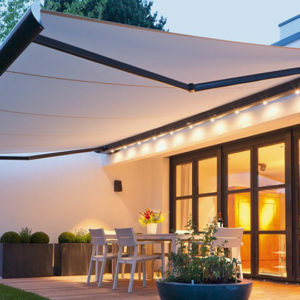 We would love to help you find the very best awnings for your home! Complete Blinds offer great online deals. In fact, you need look no further! We have a great range of awnings, and we are confident that you will find a design that fits your home, and your budget. If you would like to speak with a consultant, or organise a quote, please call on 02 8824 7975 or contact us online. We would love to help you find the very best awnings for your home! Window awnings offer many benefits. Aside from protecting windows from damage, lowered awnings can enhance privacy. Window awnings also increase the usage of the outdoor space –offering protection from ultraviolet rays, rain and hail. In addition, large open awnings can serve as parking shades in open areas. 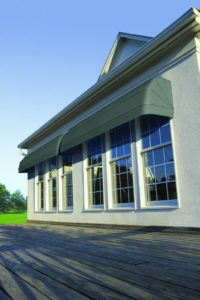 Proven to be tough and shock resistant, awnings are designed to be strong and can withstand storms and winds. They can be opened at any angle – slightly open, half-open or fully opened to provide full protection from the sun. Awnings over doors offer protection from rain and sunlight, promoting the longevity of the door and surrounding building features. They can also provide a protected space for waiting guests. In addition, they add a sophisticated and well-appointed feature to the home. In a business setting, they can provide an opportunity for the display of a company logo or design and can enhance the branding of the business. 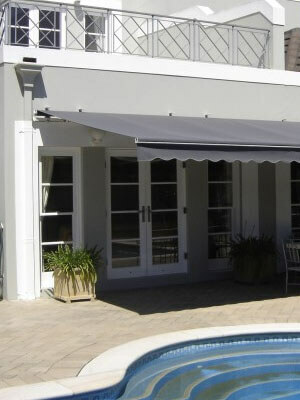 Outdoor awnings can also be customized for patios and verandas. They provide shelter from the elements and protect outdoor furniture from weather-based deterioration. Importantly, they extend the length of time within the year in which to enjoy the outdoors. You can enjoy coffee, drinks and meals with guests all year round! To extend the life of your awnings, it is important to maintain them regularly. Check once in a while for damage like bent, rusted or dented frames. Schedule an annual cleaning by using a water solution and mild soap. Make sure that lukewarm or cold water is used for cleaning. Firstly, use a broom or a stiff brush to remove any kind of debris like dust, insect nests, leaves and twigs. When you see stains from bird droppings treat them immediately. If you live in snow-prone areas, it is best to remove the awning before the snow season begins. Just ensure to clean them before storing.